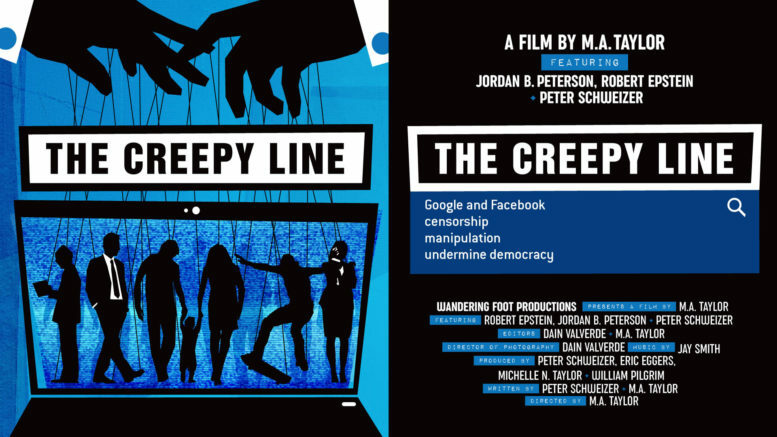 The Creepy Line, a new documentary by director M.A. Taylor, is now streaming at Amazon Prime. It takes a disturbing look at how Google and Facebook influence their users’ view of the world, and how the companies have pioneered new ways of doing business. It’s a business model in which personal data harvested from users is exploited so as to offer targeted advertising to third parties. In truth, though, by pioneering the “surveillance business model,” Google has been been stepping over “the creepy line” for years. Is is perhaps in its basic explanations of how the surveillance model works that The Creepy Line is most interesting: the filmmakers explain in simple terms how a small number of companies have come to compile extensive data profiles of many hundreds of millions of human beings, and how that data is the real product sold and used by the companies that collect it. This, of course, has always been the plan, although it was arguably much more modest at one time. There’s a lot of money to be made by helping advertisers target specific potential customers. But first you need a lot of data on the people you’re targeting. Successful tech giants can offer this data — and huge amounts of it. In order to offer advertisers data on potential customers, though, a company first has to collect it. And in order to collect it, the company must offer some sort of bait for the users to seize upon, thus leaving behind their personal data. Over the past 20 years, Google and Facebook have perfected the art of convincing users to trade online services for their personal data. And the companies’ capabilities have expanded with time. For example, in the early days, if internet users didn’t use the Google search engine to access a web site, Google didn’t know about it. Users had to use Google’s site in order to be tracked. This limited the information Google could collect. Eventually, though, Google — inspired in part by Apple — figured out it could track its users more fully by developing its own internet browser, and then developing its own computing devices. So, while one could, once upon a time, avoid Google surveillance by going directly to a web site, everything you do on your Android phone or Chromebook is harvested, analyzed, and processed by Google. Facebook, of course, has attempted similar levels of surveillance by using Facebook apps on smartphones to monitor most of what its users do with their phones. But regardless of whether or not one uses Facebook on a smart phone, the company collects data on every user’s friends, his posts, his instant messages, and every post he likes or comments on. The Creepy Line thus helps to explain one of the most important and economically significant aspects of the surveillance model in business: Google and Facebook “users” are not the customers. The real customers are the advertisers who use Facebook and Google for targeted advertising. The users are just the ones who give Google and Facebook something to sell. It’s true that users get something in return for their personal data. They receive the benefits (in terms of convenience) of using Google and Facebook services. But in this sense, the users are part of the process which creates the products and services sold by Google and Facebook to the customers. Thus, we are reminded that services like Gmail and Facebook aren’t really free at all. They only appear free because the currency used to purchase these services isn’t dollars. It’s your personal information. The film illustrates how, when it comes to companies that run on the surveillance model, our old notions of consumer sovereignty, producer sovereignty, and entrepreneur-client relationships don’t apply the way we think they do. The users aren’t the customers, and the profitability of Google and Facebook doesn’t fundamentally rest on what the users do. What really matters is that Google and Facebook can continue to extract data from enough people so as to sell a product to advertisers. Surely, this will require Facebook and Google to keep up the appearance of wishing to “serve” the people who hand over their personal data. But in a world of such immense amounts of data, many users are expendable. And this is why companies like Google and Facebook have few scruples about banishing even popular users like Alex Jones or other controversial pundits and content creators. Those people aren’t the customers. What really matters is the ad revenue. Here is a simple guide that might help you unlock some of the most profound and deep secrets of your life. It is especially well suited for children, teenagers, adults, old timers and seekers of all ages. It is a great tool to see if you are aware of what is going on in your life. What is real, and what isn’t? How do you deal with so called good and bad? It might also help you make your life as easeful, peaceful and useful as possible. This then brings us to another way Google and Facebook insinuate their company policies and views into our daily lives. By creating the software that produces search results, or which creates the news feeds in Facebook, the owners and employees of these companies decide what information users consume. This in itself is nothing particularly surprising or nefarious. After all, information publishers throughout history have controlled what information is presented. Book authors, newspaper editors, and television producers have always controlled what information the viewers and readers are allowed to see. There’s nothing fundamentally different here, except perhaps in the fact that users of Google and Facebook have been especially naïve about the degree of power these tech giants have over the flow of information through their platforms. After all, have not newspapers always cherry-picked what articles they run? Not even “letters to the editor” has ever been an open forum anywhere. The editors choose which letters the readers see. As the film notes — and as most marketing consultants will tell you — fewer than ten percent of search engine users will ever get beyond the first page of search results. This means that Google has tremendous power in deciding what information is seen by the overwhelming majority of people performing web searches. How many of these users cross-reference other sources of news? If the past is any indicator, the answer is: not many. After all, historically, most people have been content to consume whatever the newspapers tell them is the news. They consume whatever is on the evening news — whatever’s convenient. The believe whatever Walter Cronkite tells them. But this has always been an unfortunate reality of the media landscape — even before social media or Google. Most people will believe the news that can be consumed with the least effort. The “problem” with Google and Facebook is that they have taken convenience to a whole new level. And that’s where most criticisms of the documentary come in. The fact that the director, M. A. Taylor, also made the anti-Clinton documentary Clinton Cash suggests to some reviewers that the documentary primarily exists to push a narrative in which tech giants are manipulating the public to support Democratic candidates. Besides, even if Google and Facebook do manipulate their news feeds and search results on purpose, this doesn’t make them fundamentally different from the people who control what we see on CNN or Fox News. Far more dangerous is the fact that the consumers of news haven’t learned anything from decades of witnessing obvious bias in the legacy news media. In spite of the fact that the World Wide Web offers an immense variety of sources of news, research, and opinion, most users of media are content to let others be the last word in selecting the news they consume. Although The Creepy Line has attempted to portray Google and Facebook as achieving a new level of nefariousness in this regard, the critical ingredient in the manipulation of voters remains the voters. It appears the voters are content to let themselves be manipulated. They could seek out news sources other than CNN or Google News or their Facebook news feed. They simply choose not to.